Sometimes, our job takes us just outside Western North Carolina to the beautiful greater Greenville area in South Carolina. We met Julia and Will for the first time on a chilly afternoon in the small town of Saluda Hills, just outside of the city. It was their wedding day, and many of their guests had traveled across the Atlantic ocean to be a part of it. The atmosphere was full of anticipation, sincere yet lighthearted. Getting to capture each little moment as it passed, in a space so special to Julia's family, was the sweetest bit of magic. The intention put into their day was evident from the very first moments. First Looks are not just for soon-to-be spouses; they are for anyone you share a special relationship with. Julia got ready separately from her girlfriends, hoping to surprise them with her dress and experience that magic together. As soon as they saw her, tears started to fall while they all laughed and cried together. Even after the day was done, Julia shared that this moment remained as one of her very favorites. With just a little bit of time remaining before the ceremony, we got to take the bridal party members outside for some photos. Julia and Will were saving that first look for her walk down the aisle, so we were careful to coordinate around the two to keep Julia hidden from Will. The sun was bright and warm, giving the girls just a little bit of a break from the icy, chilly wind that dominated in the shade. While gathered together, we got to hear the stories that surrounded their relationships. How they met their best friends, the joy surrounding new relatives, and the excitement that these two families were becoming one. Julia and Will's wedding had a special dynamic; Will is actually British. Will and Julia met in college, while she was visiting London during a study abroad at Kings College. Both of them had a interest in playing the Ukulele. "Will was the president of the Ukulele Society and I was a uke regular," Julia remembered. It was only a matter of time before they became interested in one another! This meant that the majority of their relationship, spanning over two years, was actually long-distance. For their ceremony, Will and Julia wanted to combine both family traditions and cultures to celebrate their differences coming together. Julia grew up in surrounding Greenville area, so it seemed only fitting for their wedding celebration to be there and filled with family tradition. The two of them wrote vows specifically for each other, and sung hymns that were meaningful for them including Amazing Grace. Will remembered his favorite parts of the wedding day taking place during the ceremony, commenting that "seeing Julia walk down the aisle was a very special moment." Even the church was filled with family history - "My grandfather had helped build the church and my parents had been married there so we felt it was the perfect spot!" Julia wrote. Yes, their day was rooted in family and tradition - which made the presences of Will's family from England especially meaningful. We got married in a church on a mountaintop with an enormous window overlooking the mountains. Photographing these two with their friends was far from dull. Laughter floated in the air after their ceremony - Will and Julia were finally married! With the sun beating behind them, we snagged a few photos before the wedding party and family traveled to the reception location in downtown Greenville. Everything was perfectly timed, thanks to the bride's mother and aunt who helped plan and coordinate everything. 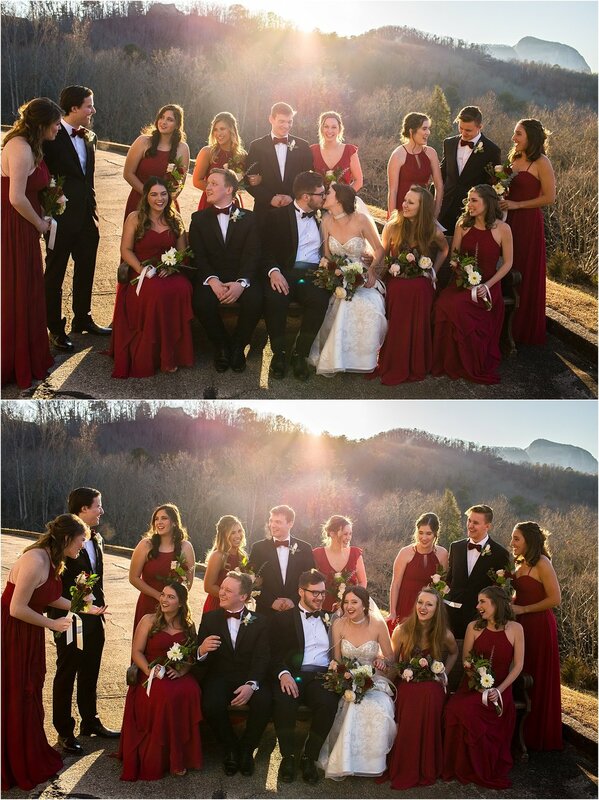 After the family and wedding party departed, we kept Julia and Will at their ceremony spot to snag some photos of the amazing Saluda Hills covered in the setting sun's golden glow. Will planned the sweetest, most sentimental proposal to ask Julia to be his wife. "I was visiting Will in London for the summer. On my birthday, Will took me around all the places we went on our first date. He proposed (twice, the first time wasn't on one knee) just outside where our first date ended. We celebrated with barbeque and ribs!" Normally, when we take the bride and groom out for sunset photos it's just the four of us, chasing light and talking. But this time, we had a little friend following us. We don't know who's sweet doggie he was, or where he came from, but he was content and happy to get a few pets and follow the new bride and groom around. Once the sun set behind the Saluda Mountains, we headed down to Greenville to join the celebration. Julia and Will danced together under the fairy lights at the Huguenot Mill and Loft in downtown, and spent the evening in celebration with their dear family and friends. You are gems, Julia and Will. Getting to know you and watch a piece of your story unfold was truly a pleasure. We wish you both the best as you carve a home in England and carve a life together. Special thanks to Deborah Jensen and Alison Hardin, who created many of the beautiful elements from their wedding and planned + coordinated their day.